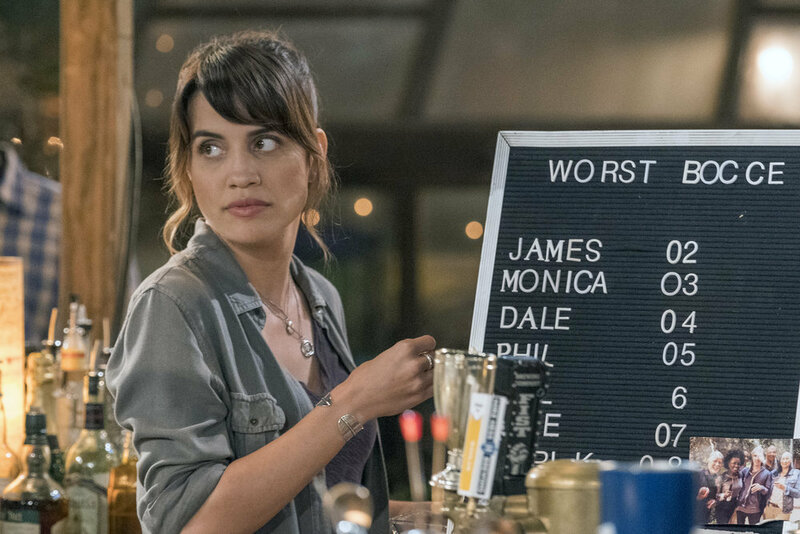 Produced by "The Good Place's" Michael Schur and created by "New Girl's" Josh Malmuth, "Abby's" is a good bar that's still working out its rules. “Abby’s” is a throwback in almost every sense of the word. A multi-cam sitcom shot in front of a live studio audience, the first three episodes of NBC’s half-hour comedy thrive on atmosphere, two great actors, and simple A- and B-plots meant to drive lighthearted laughter. The whole show is about a bartender who opens a bar in her own backyard — it’s that simple! But there’s a clue to the series’ modern sensibilities right off the bat: Instead of an actor voiceover saying, “‘Abby’s’ is filmed in front of a live, studio audience,” star Natalie Morales says, “‘Abby’s’ is filmed in front of a live, outdoor audience.” To best mimic a bar set up in a San Diego backyard, the producers built their set outside. Though this does add a distinct, almost mystical vibe to the proceedings, such contemporary updates don’t stop there. “Abby’s” isn’t built on a central romance, though it does introduce its eponymous lead as bisexual. It’s not content with letting the outside world define its stories, so it sets up a whole universe — rules and all — inside the bar. Perhaps most importantly, “Abby’s” isn’t afraid to be about nothing special at all. What’s Abby and the show value most in the world is maintaining an inviting neighborly hangout for anyone who wants to stop by. In that, it’s a throwback sitcom like its clear inspiration, “Cheers,” but without being a lazy copycat out of touch with the times. After ironing out a few early kinks, “Abby’s” could turn into the kind of reliable and desirable destination it dreams of becoming — though it might have to make a few compromises. Oddly enough, this is what the pilot (and loose overall premise) is about. Abby (Morales) is a bartender pouring cheap, no-frills drinks to working class, no-frills customers. She runs a tight ship, relegating new customers to a waiting pen before they can move to a random chairs section after proving their devotion. After six months or so there, maybe they’ll get to sit at the bar with the die-hards like Neil Flynn’s Fred, a Norm-like drinking enthusiast who cares so much about the spirit of drinking he’ll knock back terrible shots just because they’re free. Or maybe they’ll grab a seat next to Beth (Jessica Chaffin), a single mother who loves the bar because it’s within sight of her kids’ bedroom. She needs the escape, and no one at Abby’s is going to judge her for it. Well, no one except Bill (Nelson Franklin). The stickler nephew of Abby’s now-deceased landlord, Bill shows up to discover his tenant has built an unlicensed, makeshift bar on his property, and he’s of no mind to let it continue. The stubborn personalities clash and by episode’s end, a compromise is reached so the bar can stay open and Bill can come visit with a seat reserved at the heart of the action. On paper, most of this sounds good, maybe even great. In execution, there’s a lot to be ironed out. For one, the rules at Abby’s feel like a ported over component from “The Good Place,” except instead of building out an unimaginable space, they further confine an easily understood one. There are so, so many rules, often listed, and few provide any actual laughs — they should be there to take advantage of the cast’s goofy physical comedy or push the plot forward as needed, but instead they’re just a conversation piece for the characters to continue avoiding any characterization. That’s the other thing: So far, we don’t know anyone that well. Abby did two tours overseas and has created a life where she never, ever leaves the 500 square feet connecting her home and office. Why? What happened to her? Is this healthy behavior? Should we even care? The same kind of questions pop up for the rest of the regulars, even after the second episode is spent prodding the close-mouthed bartender to open up. (She does, but not nearly enough.) 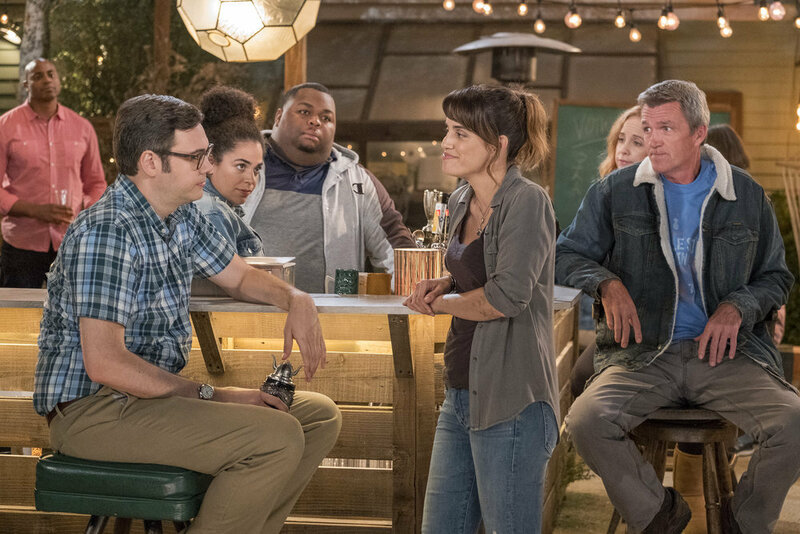 It’s OK for “Abby’s” to cruise along without high dramatic stakes, but “Cheers” and most comedies build on a foundation of endearing, identifiable, and/or very, very funny characters. “Abby’s” needs more of them. Morales and Flynn are strong right out of the gate, but the rest of the cast doesn’t stand out. Some need better material (the scripts’ pacing is off as often as its jokes don’t land), others need to elevate their personalities. It’s good that Abby and Bill don’t have any chemistry whatsoever because it reminds us this show isn’t based around the will-they-or-won’t-they question, but Franklin has to find a way to be an additive presence instead of a neutral one — he’s never really had this big of a role before, and the kind of energy given to quick quips doesn’t carry over when you’re onscreen most of the episode. If “Abby’s” is judged purely by modern standards, it may not live long enough to make the necessary adjustments. But if viewers take to its old school charms — and NBC responds with an old school timetable for success — the future looks bright. Like any new beer, finding the right mix of ingredients means being afforded the time to experiment. The clock is ticking on this brew, but it’s made from good hops. “Abby’s” Season 1 premieres Thursday, March 28 at 9:30pm ET on NBC.